Arthur Wardle was best known for his paintings of domestic and wild animals, as well as his sporting scenes. He was thought to be a ‘natural’ and it is said that he was completely self-taught. His first work was accepted for exhibition at the Royal Academy in 1880 when he was just 16 and was titled: Study of cattle on the banks of the Thames. 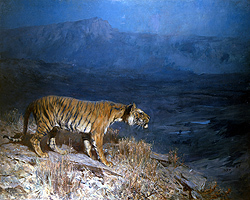 It appears that his first major work to feature wild animals was titled Panthers Resting and was exhibited at the Royal Academy in 1891. From this point on, the exotic animal became an important element in many of his more important works; among them were: Leopards Drinking (RA 1896); The Tiger Pool (RA 1897); Jaguar and Macaw (RA 1899); Puma and Turkey (RA 1902); Startled (RA 1909); Lions: sunset (RA 1913); Indian Leopards (RA 1916); Snow Leopards: the flush of evening (RA 1921) and A Jungle Story (RA 1936). Wardle derived additional inspiration from mythological and literary subjects and would incorporate his exotic animals into these works as well. Among these works were: A Bacchante (RA 1909); Forest Lovers (RA 1917) and Sea Reivers (RA 1925). For most of his career he lived at 34 Alma Square, St. John’s Wood and was a highly successful and accomplished artist during the period. In all he exhibited more than 100 works at the Royal Academy; 29 at Suffolk Street and 20 at the new Watercolor Society. Wardle died on July 16, 1949.